We are not the first time I saw the actual photos of the Xperia U, but this time in particular, coupled with the the Xperia S-compared, more can confirm that this is the mini version of the Xperia S. Appearance, Xperia U the same "Iconic Identity-based design, part of the key position adjustment and changed can change the electrical design, basically Xperia S-same nature, whether it is at the bottom of the zona pellucida, or the curved design of the back are also inherited. 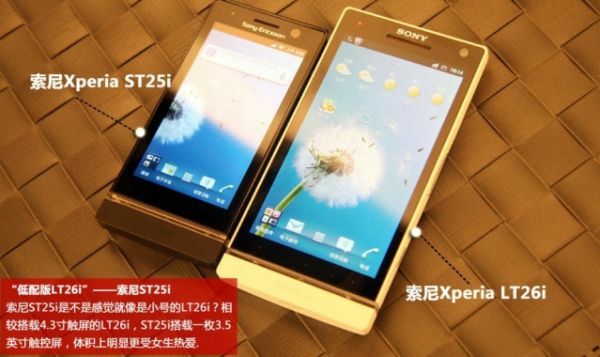 Rumors, Xperia U 1GHz dual-core processor, 3.5-inch 854 × 480 screen, with Sony's Bravia Engine image processing engine. The back also has a Sony Exmor R cameras, LED fill light, and supports 1080p video, but the CMOS pixel is significantly reduced to 5 million. In addition, from the picture, Xperia U retains the design of the SIM card, but is pumped Micro HDMI output capabilities, the battery capacity is only 1290mAh capacity significantly too small. Located in the middle Xperia U is expected to be officially unveiled the Sony brand in the MWC Exhibition systems temporarily equipped with Android 2.3.7 version officially listed after the up to Android 4.0 the ICS.